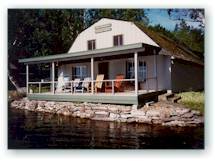 Relax and refresh your spirit at beautiful, uncrowded, unspoiled Lake Molunkus Sporting Camps. Since 1904, our guests have enjoyed some of the best fishing, hunting, and vacationing in Maine. Whatever your preference, you will find well-maintained cabins, soothing hot showers and a friendly, comfortable atmosphere. Drop in and visit us some time. Sit down on the main lodge porch, gaze down the lake, and unwind. 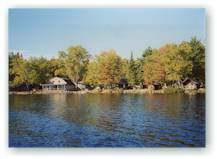 Situated at the head of Molunkus Lake, 11 miles north of Mattawamkeag, Maine, Lake Molunkus Sporting Camps is nestled deep in the forests of southern Aroostook County. The camps started as a logging operation in 1880 and became a sporting camp in 1904. Most of the original buildings are still in use, including the main lodge. There are also nine log cabins, six newer housekeeping cabins, a central bathhouse (for cabins without bathrooms), other support buildings, and a rifle range. Copyright © 2017 by Janet Grondin & Bill Quimby. All rights reserved.